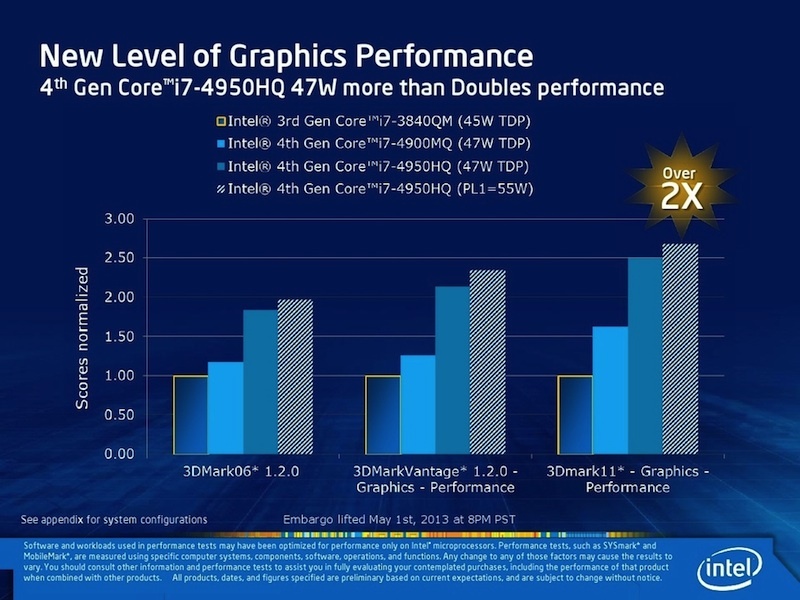 SemiAccurate says that Intel will become Apple's supplier of ultra-high performance version of its Haswell for the coming MacBook Pros. According to the report, the chips will boast a special version of Intel's highest-end GT3e (Iris Pro 5200) integrated graphics. It was Apple that requested a special top bin cream-of-the-crop GT3e selection from Intel, with "as much GPU power as possible." Now when most of the top chips are bought by Apple, much less will remain for Intel's other customers. Apple was rumored to release its next generation Haswell-based MacBook Pros at WWDC with the Haswell MacBook Airs, but that did not happen. The 13-inch and the 15-inch MacBook Pros are shown in benchmark results, which means the release is coming soon. The benchmarked 15-inch MacBook Pro will feauture a Core i7–4950HQ chip running at 2.4 GHz, along with Iris Pro 5200 integrated graphics. They are the best that Intel has to offer. According to Intel’s promotional materials, the Iris offers 2–2.5x the performance power as the i7–3840QM chip with HD Graphics 4000 in the current high-end Retina MacBook Pro. However, the new Retina MacBook Pros will probably boast even bigger performance boosts. KGI Securities analyst Ming-Chi Kuo has recently claimed that the launch of the updated MacBook Pros will take place in mid-September. Stil it is not certain whether Apple will refresh both the Retina MacBook Pros and the standard MacBook Pros, but it is rumored that the non-Retina models will not be produced any longer.